With Wendy & Lucy and Meek's Cutoff, minimalist director Kelly Reichardt established herself as a political, albeit contemplative and practical, director interested in examining culturally thorny topics like living on the edge of an economic void (Lucy) and the role of women during the European settlement in the Americas (Meek's). Normally, such topics would incite grandstanding and soapbox preaching amidst a narrative tainted by persisting moral vanity. But Reichardt isn't an egocentric director trying to establish an image so much as she's genuinely motivated by exploring the complexities of issues that don't have easy solutions. With Night Moves, her fourth and arguably most accessible film, she details the motivations and rationale of a group of militant environmentalists plotting to blow up a dam. Their goal is idealistic, hoping to incite a social dialogue about rampant energy consumption and the resulting decimation of a natural landscape to sustain it, but their assessment of repercussions and potential blowback stops short of considering anything negative aside from the obvious problem of being arrested. Originally, the plan involves only Harmon (Peter Sarsgaard), a mostly undefined, albeit morally ambiguous, practical logistic coordinator, and Josh (Jesse Eisenberg), a generic twenty-something living and working at a sustainable agricultural co-op. What complicates matters, at least for Harmon, is Josh's decision to include disillusioned college dropout Dena (Dakota Fanning), a rich girl grappling with the theoretical application of imposing social change on a reluctant populous. For the first half of the film, Reichardt limits her characters socially and psychologically, forcing them into an enclosed world where only the plan and their internal dynamics matter. Despite approaching others to purchase fertilizer or a boat, their behaviour is detached and calculated; it's performative when necessary and exclusionary otherwise. That they limit themselves to those that share a very specific ideological stance is key; they're working together to enact a plan that the world around them is implicitly (despite not being conscious of its eventuality) trying to avoid through laws and basic ethical composition, making their act one of anarchic rebellion. The divide between setting off the bomb and resultantly having to live with it is deliberate. Reichardt doesn't give away any hints as to where the story might go after the carefully orchestrated plot, one that has many hiccups and a persistent sense of tension, unfolds. It makes the eventual psychological thriller component somewhat surprising—despite being a logical progression—and subversive, remaining within the lexicon of politics without dwelling on it. Ideally, the three were to avoid talking to each other in an effort to evade suspicion, but when one of them has a moral crisis, questioning if they should go to the police, the resulting paranoia and power struggle transforms this seeming environmental parable into one of gender power dynamics and the compounding weight of mental malaise. Reichardt, being a director that prefers to dwell in the quiet, unspoken apprehensiveness of any given moment, gives an entirely different sensibility to a fairly standard social deconstruction. 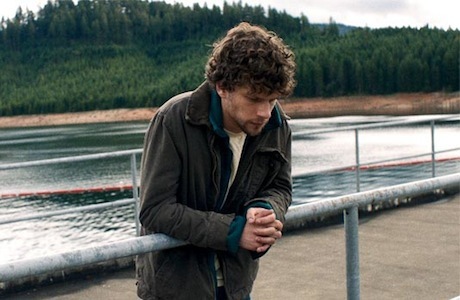 If tackled by a more traditional director, Night Moves could easily have played as a standard thriller, eschewing the internal implications of acting on ideals in favour of sensationalizing the many tight situations these characters find themselves in. Because Reichardt takes a deliberate, slow moving approach to the material, it's almost surprising that anything beyond mere conversation happens, inverting the expectations of a psychological thriller by making it an analytical art film that, in part, evades its own trappings. This strange balance between assessing the basic tenets of contemplating social change while adhering to the tropes of a formulaic narrative, subverting the status quo of cinema through subtleties like tone and emotional focus, is what inspires thought, partially suggesting a method for shaking up traditionalist thinking through method of storytelling. It's just a shame that in juggling these two worlds, Night Moves struggles to maintain believability in the third act when everything becomes a little too big for the mostly subdued template.